I’m sometimes surprised and disturbed by how difficult it is to have someone speaking up openly on that matter, how important it can be in consulting relationships. Regardless of your role in your organisation you might even consider the above as an idealistic dream that nobody will ever fulfill. Maybe if you are a consultant, you dared say it assertively during a networking event where you were maybe a bit too pushy (or drunk)… But now, with hindsight, do you believe what you said? Look in the mirror. Is the guy/girl there always putting the interests of his/her clients first? Of course not. Relax. Neither do I feel allowed to state that so bluntly. First of all, we rephrase this rather vague sentence. In something like: “in every decision where their client interests somehow conflict with their own interests, consultants always give clients’ interests a significantly heavier weigth than their own”. (Yes you could discuss “significantly”, you could argue on “perceived” and “true” interests”… but that’s not the point). So it has to do with decisions and conflictual interests then? Yes, of course, but not only. It has to do with our fear for the future, and our survival instincts. Even if people manage their fear in different ways, fear is a perfectly normal feeling, and it is normal to have it! Very normal indeed! Still, like in any other human relationship, people around you can capture your emotions, even if not spoken out, even if unaware. And yes, protecting oneself is one of the most expected behaviours for a fearful person. And if you protect yourself, guess what, the interests of your clients come… after. So, we’re in a situation where you are paid for a service. That service involves making/facilitating decisions. And those decisions are biased by your fear for the future. See? Not good, right? Okay, that’s for the analysis… Is there a cure? I think yes. Or at least strong mitigators I’d say. Well first of all, it is a good idea to look at your financial stability. I will not explain how to address that. That should sound rather familiar. What-if scenarios is a possible way to come to a figure. You can investigate that yourself and make a plan. (Don’t forget to take actions too…). If you have financial stability, the bias will be lighter. Still present though, but lighter. Emotionally and spiritually too it’s important for you to consider if confidence in the future resonates in you. Why so? Or, why not? If you’re not comfortable with why you do this job, what its purpose is, that can be the reason of your fear! Our brain not always tells us things like they are. Sometimes we only get weak signals! Fear is one of them. Finally, there’s one very strong counterbalancing value: sense of service. If your professional purpose is to serve your clients, you will instinctively put their interests first, even implicitly, in most decisions. I’m mixing value and purpose a bit I know. What I mean is that sense of service is what you naturally live up to on a daily basis. Did you try to develop this value? Do you know where to start? What will you get from this? Well maybe the question is wrongly stated if you follow me on what sense of service really means. A better question is “how will the consulting relationship benefit from this” ? 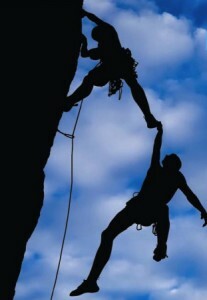 Simply: mutual trust. And the magic of it is that this mutual trust builds up without any directly targeted action. It simply develops for the simple reason that for your last decision, you put the interests of your client first. You might find this important.